This clever little seal narrowly escaped death by jumping into a Canadian couple’s boat—and it was all captured on video. The surprise appearance by the blubbery swimmer happened on the Campbell River in British Columbia, Canada, where a small group of people was out watching orcas in their natural habitat. The group watched as the orcas chased the seal around, tossing it around in the water, before it eventually fled to the boat. Then, to everyone’s surprise, the seal hopped into the rear-end of the boat just in the knick of time. The seal’s life was saved, and the the group of orcas continued circling the boat. But the chase was far from over. The seal inevitably jumped back into the water before immediately regretting his decision and jumping back into the boat. 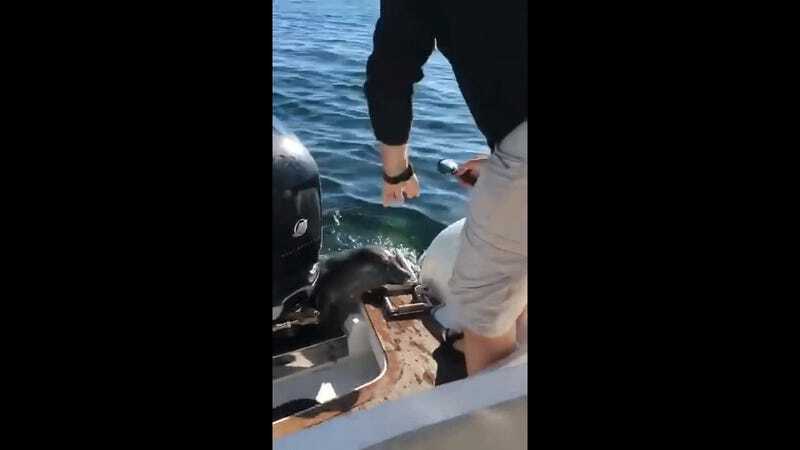 The second time, the seal luckily positioned himself away from the boat’s motors so the crew could flee from the scene. The rest is history.